The tour guide was fantastic and the Taj Mahal was breathtaking! The tour guide was knowledgeable and fun and made me laugh a lot. We went to an okay place for lunch- that's the one thing I would change and then a couple of shops that felt like tourist traps. I recommend this trip. This was an amazing trip, the Train ride was very pleasant and was so fast, I was greeted at the train by my guide who if there are Hindu Saints he is one of them. The Tour of Taj Majal and Agra Fort was informative and very enjoyable. Can't say enough about this trip, just terrific. Even when you pay such a high price relative the local reality, they still make you visit shops/factories where you are welcomed to buy their stuff. If you are interested in buying marbles that might be fine, but honestly, I was told we would visit a school where descendants of those who built the Taj learn the marble art. All I saw was three guys working marble in a corner of a shop, and after two minutes you are invited to come in, have a tea and see the collection...that you can buy. Since I was not even prepared to spend money, it seems that our tour suddenly got shortened. 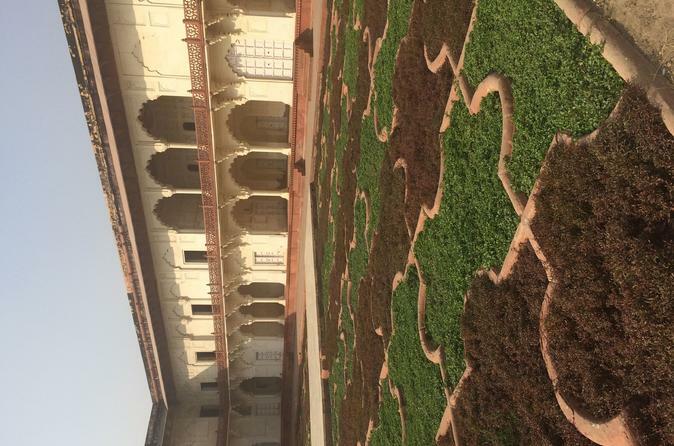 The only two things I was deliberately taken to visit was the Taj Mahal and the Agra fort! At 2PM we were done and, after much asking, I was taken to a really small temple in the outskirts of Agra. Tour finished after that and I was taken to the station where I had to wait 2h for the train. So you wake up at 5AM and come back at 8PM, but spent 3h waiting for trains. Even though they say all fees/taxes are included, that means the personal guide and transports. When I said I really didn't being much money for this day trip, and the tour could be at risk, they arranged a free lunch. That's worth a start to this review. The two drivers one in Delhi and one in Agra and my tour guide tried to provide good service. Kumar was a good and knowledgable tour guide. Expect to be taken to 2 - 3 pre-selected shops where the assumption is that you will buy something. The train car was air conditioned and the seats were fine. Not great, but fine. There were security guards outside both ends of the car, which a local told me is to ensure that no one without a first class ticket goes into the car. Each car has one Western toilet, but you'd better bring your own paper and be prepared to hover. A local also told me they now have an express from Delhi that gets you there in 90 minutes. Not sure if this company will move to that option. 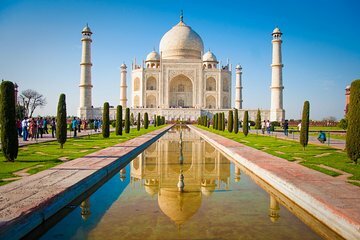 Your trip price does not include lunch 700 rupees with tax, Taj admission 1000 rupees, Agra admission 500 rupees or the price you'll pay to ride the 500 meters to and from the Taj 200 rupees. - My train arrived in Agra at 10:30. We had seen everything there was to see at both the Taj Mahal and Agra Fort and eaten lunch by 2:30, leaving 4 hours to kill before my train departure time of 6:30. After the shopping it was just 3:30. They made an effort to entertain me, but in the end I sat at the Costa Coffee for about an hour and a half. If I had taken a car, I could have been back to my hotel in Delhi before 6:30. - I was under the impression that this was a group trip and purposefully booked this trip because I was a woman traveling alone and did not want to be by myself. For the most part this wasn't a big deal, except when I had to get from the train to my driver outside the station and then at the end of the day. The driver dropped me off at 5:30 outside the station, leaving me 90 minutes to kill train was late. I don't think I was ever in danger, but just something to be aware of if you are alone w/o a local SIM card. - You can get there just as fast in a car and have more flexibility on your return. Really good tour and our guide was super considering our needs. It got very hot and he was accommodating and helpful. Definitely recommend.